This weekend begins a three weekend Beethoven series by the great Houston Symphony Orchestra at Jones Hall in Houston, TX. The fetching Mrs. Sheralyn B. and I will be in attendance to watch our dynamic young conductor, Maestro Andres Orozco-Estrada lead the orchestra in Beethoven's symphonies #2 and #8. 1. Symphony # 9 "Choral"
3. Symphony # 3 "Eroica"
3. Scherzo, 4. Allegro molto. Beethoven's Symphony #8 is scored in F-Major with four movements: 1. Allegro vivace e con brio, 2. Allegretto scherzando, 3. Tempo di Menuetto, 4. Allegro vivace. In the You Tube video below, Symphony # 8 is from the 2012 BBC Proms with Maestro Daniel Barenboim. As always when Mrs. B and I go to a symphony concert at Jones Hall, I like to give you just a little of what we will be hearing tonight. 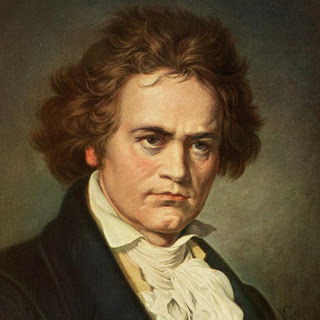 So, please turn up the volume and enjoy some great symphonic Beethoven.